App Rank Drop After the First Week? I'll Tell you Why. If you are asking yourself the question “Why does my iOS app rank drop or plummet?”, this article is for you. 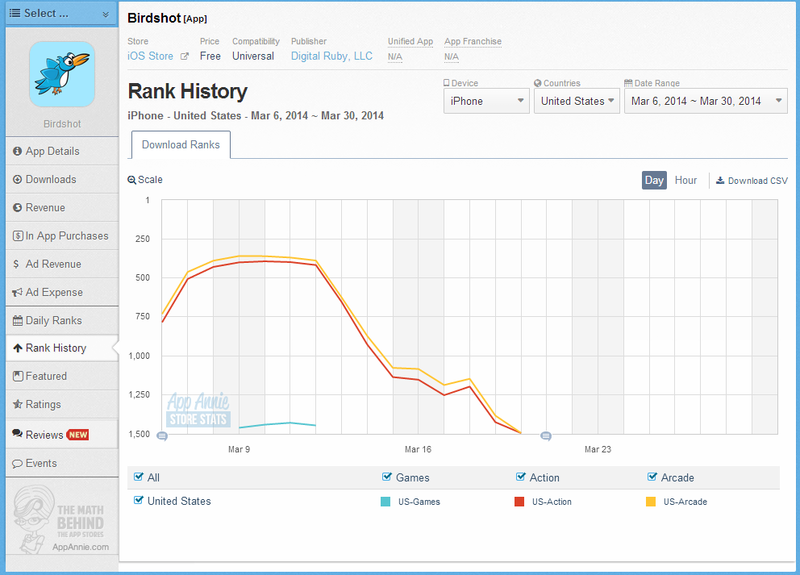 Many of you have no doubt released an iOS app and seen encouraging rankings during the first week your app is live. 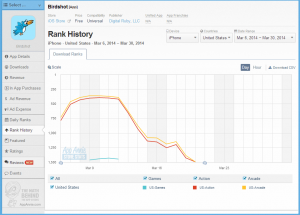 Downloads are increasing, and your app rank is going up. You pat yourself on the back and begin a celebration. After about a week, the celebration abruptly ends, and you wonder what is wrong with your app. Downloads are down, ranking is falling and you wonder if Apple penalized your app or if there is a bad bug in it or something else is horribly wrong. 1- You get to be featured in various parts of iTunes (this is probably somewhat subjective based on how the reviewer liked your app, but all my new apps have been getting featured in various places for about a week). This feature goes away after about 7 days. 2- Your keywords and title get a search ranking boost. This is easily tracked via tools like MobileDevHQ that send a daily email report on your keyword rankings. After 7 days, your title and keyword rankings will fall off a cliff. Just to let you know, your app is not the Spartans, it’s those other guys. I’m still working on Birdshot, trying to get user feedback and make the game more interesting. Try it out if you want here: Birdshot on the App Store. What is to be done? Well if you keep watching the video after the cliffs part, that’s when your app becomes the Spartans. You get assaulted by everything. Your app gets pummeled. The solution? Recover and keep working on your app, make it better, submit constant updates and listen to user feedback. Make your app awesome. Find what your competitors are doing and do that cheaper and better. It takes a lot of time, but it is a proven formula. I didn’t make any money from You Doodle for the first 6 months, and I worked on it nearly every day. I now consider You Doodle a VERY viable alternative to Adobe Photoshop Touch, for a fraction of the price! Good luck in your software battles and app success!